An Agriculture and Agri-Food Canada researcher has identified a gene that will be key in breeding new soybean cultivars with resistance to Phytophthora sojae, which annually causes up to $50 million in losses in Canada and between $1 billion and $2 billion in losses globally. Sangeeta Dhaubhadel is a research scientist specializing in genomics and biotechnology at AAFC’s Research and Development Centre in London, Ont. In a study published in late 2017 by Dhaubhadel’s then-Masters student, Caroline Sepiol, Dhaubhadel’s team identifies 11 functional resistance genes, of which one gene – GmCHR2A – shows most promise for resistance breeding in soybean. P. sojae is an oomycete, or a fungus-like soil-borne pathogen, that can stay in the soil for a long time. It causes root and stem rot in soybean and can attack at any stage of the plant’s development. What makes P. sojae particularly difficult to control is the fact that there are at least 200 races of the pathogen, meaning a plant carrying resistance to one race of pathogen will be susceptible to other races. Researchers have identified the races that are prevalent in particular regions, and they typically try to breed cultivars that are resistant in those regions, says Dhaubhadel. “This gives complete resistance, but pathogens change over time; they undergo mutations, and eventually the resistant cultivar becomes susceptible because it no longer recognizes the pathogen,” she says. It is thought that complete resistance to a race of the P. sojae pathogen typically lasts about seven to eight years. Thus, resistance breeding can be done in two ways: breeders can breed cultivars with complete resistance, meaning 100 per cent of potential yield is captured for seven to eight years, when resistance breaks down. Alternatively, they can breed cultivars with partial resistance, which is governed by multiple genes with minor effects – a kind of “broad spectrum” resistance that isn’t race-specific and is more durable, but means producers only capture perhaps 60 to 80 per cent of potential yields in affected fields. Dhaubhadel says breeders can build both partial and complete resistance into soybean cultivars, to offer race-specific complete control as well as longer-lasting control. One of the many benefits of breeding cultivars with both complete and partial control is that partial resistance will work for other diseases beyond P. sojae, she says, making plants more resilient to attacks from multiple sources. Dhaubhadel’s lab is focused on locating plant immunity to P. sojae through isoflavonoid compounds. “When plants are stressed, they produce isoflavonoid compounds to help combat the stress,” she explains. Soybeans contain an isoflavanoid compound called glyceollin, which works like an antimicrobial compound to confer resistance to disease, and which is synthesized via a long, complicated biosynthetic pathway. Genes that trigger this response in leguminous plants are critical, says Dhaubhadel, because they divert metabolites toward the synthesis of glyceollin. 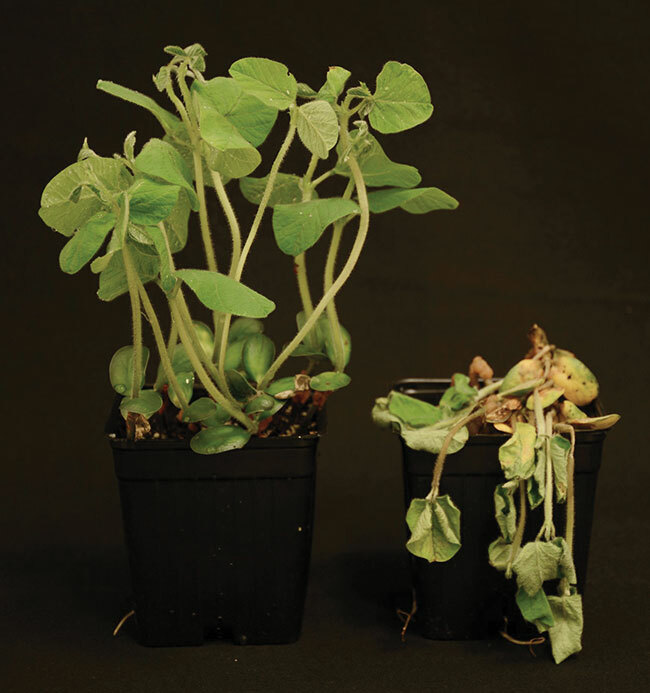 But these genes are present all over the soybean plant, and Dhaubhadel’s team wanted to find genes specifically in the root zone, where plants come under attack from P. sojae. Using computer bioinformatics analysis to search the soybean genome, which is publically available, the team looked at subgroups of big gene families and found 14 genes that possibly confer resistance to P. sojae and are involved in the rapid production of glyceollins. They narrowed that group down to 11 genes that were functional. Of these 11 genes, only four were found in the root zone. 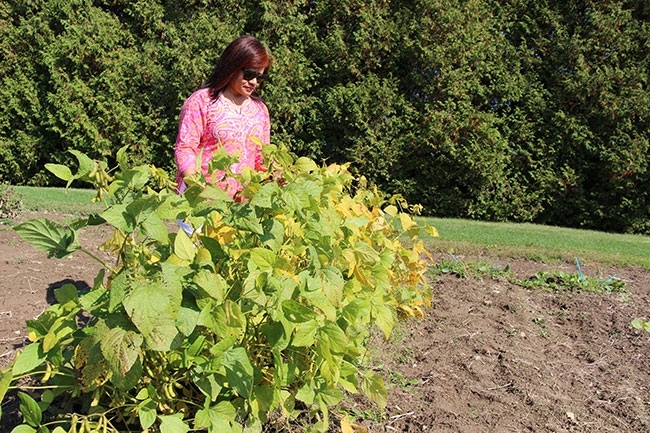 Ag Canada research scientist Sangeeta Dhaubhadel inspecting soybean plants in the field. One gene, which the team calls GmCHR2A, controls the expression of this trait at the fastest rate in the root zone. Once GmCHR2A was identified, Dhaubhadel’s team compared their work to that of soybean breeders’. 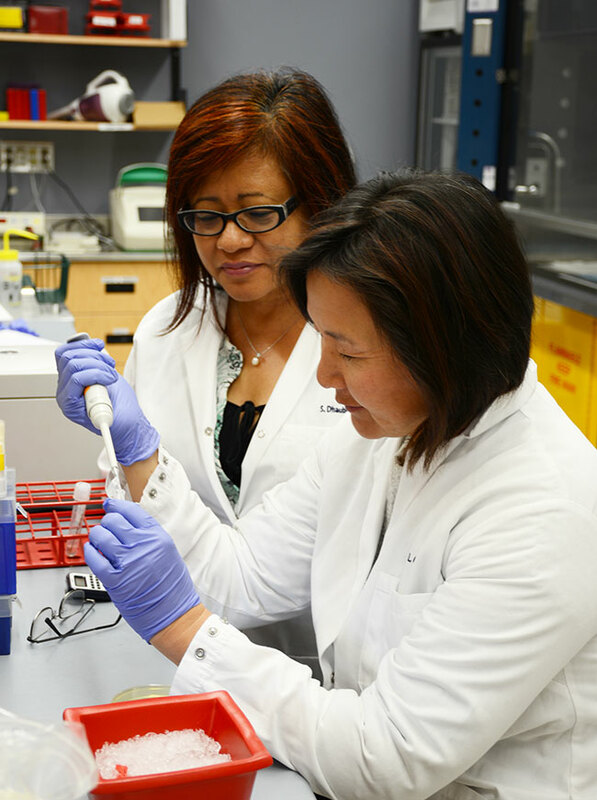 They found that breeders had identified large segments of DNA called QTLs, containing hundreds of genes, including GmCHR2A, that conferred resistance to P. sojae in the field – but hadn’t identified which particular gene was responsible for that resistance. Dhaubhadel’s team collaborates with soybean breeder Istvan Rajcan at the University of Guelph. With Rajcan, they are attempting to come up with gene-specific genetic markers in order to avoid transferring unfavourable traits into new cultivars along with resistance traits. “My goal is to find out all the gene family members involved in the synthesis of these compounds and figure out which ones are important for which kinds of disease,” she explains. These genes are already present in varieties in the field, Dhaubhadel says – they aren’t “new.” But once it is known which specific genes control the expression of which traits, resistance breeding can become faster and more targeted. Though partial resistance doesn’t confer complete resistance, Dhaubhadel believes it is key in making soybean varieties more resilient over time. “If there is both complete and partial resistance in cultivars, this is always safer for soybean growers.